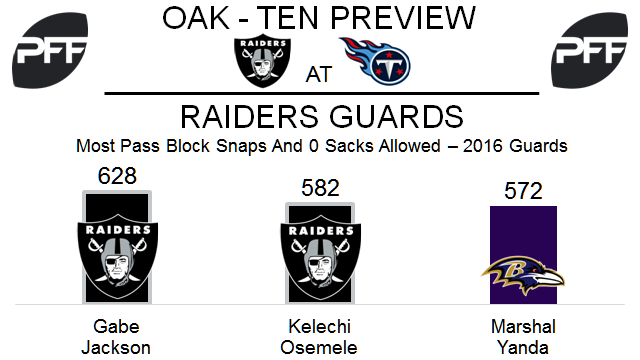 G Kelechi Osemele vs DI Jurrell Casey – This is a premier matchup of big men between two of the NFL’s best. Raiders guard Gabe Jackson and center Rodney Hudson will also do battle with Casey, but 479 of Casey’s 728 snaps in 2016 were from the right side, so Osemele will see him most often. Last year Osemele was PFF’s fifth-ranked guard with an 87.4 overall grade. He did not allow a sack in 582 total pass-block attempts, second most at guard to his teammate Jackson. Casey had an 87.1 PFF grade last year and was the 10th ranked interior defender. He had five sacks and was seventh in PFF pass-rushing productivity (pressures per snap with weighting toward sacks) among interior defenders with 300-plus pass rush attempts. RB Marshawn Lynch vs LB Avery Williamson – Lynch will make his return to the NFL this week after not playing last season. In 2015 with Seattle he led all running backs with 100-plus touches in PFF’s elusive rating at 79.0 (measures a runner’s success beyond the point of being helped by his blockers). Williamson is one of the best run stuffing linebackers in the league, finishing eighth in run stops (plays graded as a “loss” for the offense) among linebackers in 2016 with 35. He was sixth at linebacker in tackling efficiency against the run with only two missed tackles in 68 attempts. WRs Amari Cooper & Michael Crabtree vs CB Adoree’ Jackson – Jackson was selected in the first round this year by Tennessee, and he will see extensive action if cornerback LeShaun Sims can’t play this week. Of the 89 wide receivers that ran 300-plus routes in 2016, Cooper was 18th in yards per route run at 1.95, and Crabtree was 28th at 1.85. This preseason Jackson was targeted 12 times in 44 snaps in coverage, and allowed nine catches for 116 yards. His 2.64 yards per cover snap was 141st of 143 cornerbacks that played 40-plus snaps in coverage. 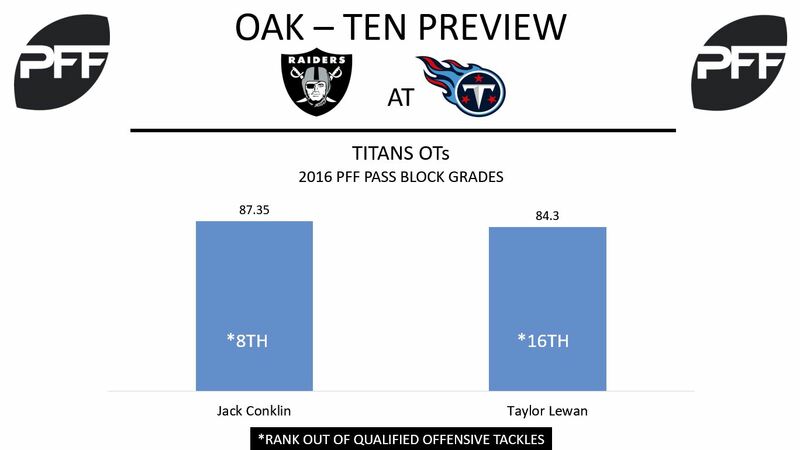 T Jack Conklin vs. Edge Khalil Mack – Right tackle Jack Conklin posted a 95.7 pass-blocking efficiency last season, which ranked 20th among tackles. He allowed 31 total pressures. This week, he’ll see a heavy dose of outside linebacker Khalil Mack, who was PFF’s top-graded edge defender at 95.2 in 2016. He applied 65 of his 96 total pressures from the left side last season. Additionally, he had a run defense grade of 91.6. TE Delanie Walker vs. S Karl Joseph & CB Sean Smith – Tight end Delanie Walker ranked ninth at his position with a PFF overall grade of 82.2 last year. He averaged 1.89 yards per route run and had six catches that were targeted 20-plus yards downfield. Titans quarterback Marcus Mariota averaged a passer rating of 108.6 when targeting him through the first 15 weeks. With Raiders rookie safety Obi Melifonwu reportedly out for eight weeks following knee surgery, safety Karl Joseph and cornerback Sean Smith will likely handle coverage duties against Walker. Walker ran 58.3% of his routes from the slot last year. Joseph allowed five catches on six passes for 48 yards in slot coverage, while Smith gave up six catches on seven targets for 70 yards and a score. RB DeMarco Murray vs. LB Marquel Lee – Running back DeMarco Murray’s 50 forced missed tackles last season ranked sixth at his position. He had an elusive rating of 34.5 and a breakaway percentage of 22.2. 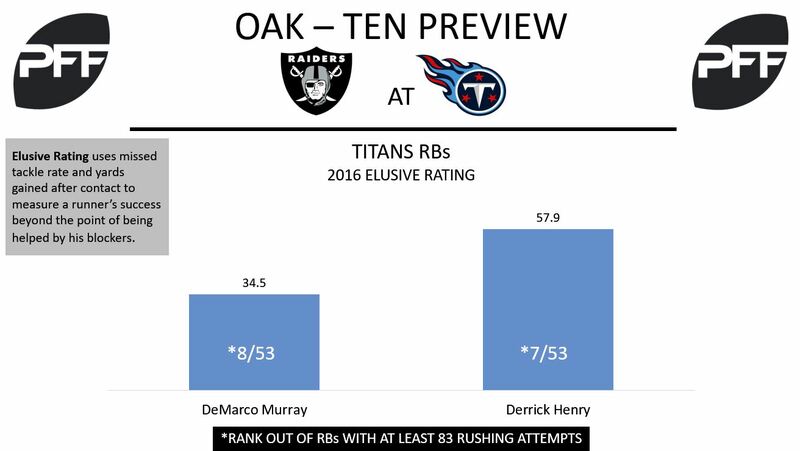 In the Titans’ 17-10 loss against the Raiders last season, Murray earned a PFF overall grade of 90.1, which was the highest for a running back in Week 3. In that matchup, he forced seven missed tackles and had an elusive rating of 143.7. This year, the Raiders feature a rookie at inside linebacker in Marquel Lee. During the preseason, Lee made just one run stop and had one missed tackle. At Wake Forest last season, Lee missed 10 tackles and recorded a run-stop percentage of 12.1, which ranked 13th in this year’s class.